Socialist Paul Murphy wasn’t happy with PBP after losing his seat in the Euros. Now they’ve declared a candidate in Dublin South-West. 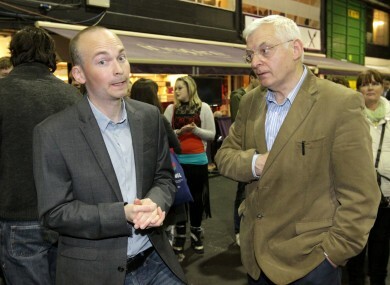 Paul Murphy, pictured with Socialist TD Joe Higgins. PAUL MURPHY, THE former Socialist MEP running to fill Brian Hayes vacant Dáil seat, says he would have preferred if rival left-wing group People Before Profit hadn’t run a candidate. “Obviously, it’s their right to stand,” Murphy said, adding that he planned to have talks with the PBP candidate, Councillor Nicky Coules, in the coming weeks on the issue of vote transfers. Murphy, who lost his European seat in May, will contest the Dublin South-West vote under the ‘Anti Austerity Alliance’ banner. The ex-MEP was fiercely critical of PBP rival Bríd Smith for entering the European race in the aftermath of his election defeat, saying the vote count showed her presence in the field had split the vote. “It think it’s a statement of fact that Bríd Smith standing endangered the left seat,” Murphy told TheJournal.ie today. I don’t think the same danger of the vote being split is posed this time. I think the dynamic of the election his different. Coules, a retired plumber who was elected to South Dublin Country Council in May, declared his candidacy yesterday. He said he hadn’t spoken to Murphy in advance of entering the race, and noted that the group had one eye on the next General Election, when the constituency will become a five-seater, following boundary changes. The two left-wing groups both did well the areas in May’s local elections, with the AAA securing four seats on South Dublin County Council, and the PBP three. There would have been closer contacts on election strategies between the two left-wing groups when both operated under the ‘United Left Alliance’ banner. The Socialist Party left the ULA at the start of last year. The Anti-Austerity Alliance, which includes Socialist Party politicians, was set up in February 2014. Sinn Féin’s Cathal King, also a serving councillor, is considered the front-runner to take the seat in next month’s vote. Email “Ex-MEP "would prefer" if People Before Profit had stayed out of Dáil race”. Feedback on “Ex-MEP "would prefer" if People Before Profit had stayed out of Dáil race”.